Wholesale polished diamond traders are seeking the right level for pricing diamonds, with the overall trend being stability, with small adjustments according to demand. After the previous week’s modest declines, asking prices of polished diamonds inched up 0.01% during the past week, according to the GDX index. 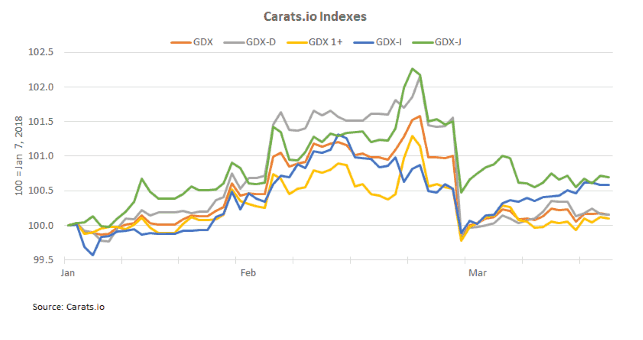 GDX, Carats.io’s general index, averaged 10,016.61 during the 11th week of the year (March11-17). The index represents the most tradable diamonds in the Israeli diamond market. The GDX index opened the week at 10,021.92 and closed at 10,015.27, dipping on Tuesday and bouncing back on Wednesday. Polished diamond prices rose ahead of the Hong Kong International Diamond, Gem and Pearl Show, held February 26-March 2, and then softened in response to less than expected demand. In the past week, Israeli diamond traders corrected pricing to meet current demand levels, reflecting ongoing strengths – where they exist. Prices of smaller goods, mainly 0.30-0.39 carats, have been in strong demand in recent months, contributing to the rise in GDX-D, an index of smaller size diamonds weighing 0.18-0.99 carats, which rose 0.08% during the week. The index averaged 4,008.8. Conversely, GDX-1+, and index of larger goods, continued to decline for the third consecutive week. The index tracks round diamonds weighing 1.00-2.50 carats. The decline in demand for these diamonds is partially a result of a shift in consumer demand from larger diamonds to smaller diamonds. The GDX-I index, which represents the top color and clarity polished diamonds traded in the market, was again the strongest performer, rising on average 0.17% during the past week. GDX-I opened the week at 2,008.47 and closed at 2,011.60. GDX-J, an index of the most popular diamonds for the US jewelry market, has been on a downward movement since the start of the month.